I’m Lars Bakken from Bungie, here on behalf of the entire team that worked on Season of the Drifter. We can’t wait for you to jump in and experience everything we’ve created for this new season of gameplay and rewards. You may have seen the videos from our reveal, but there are some crucial details that will give you a leg up on the competition. On day one of Destiny 2: Forsaken‘s new season, you’ll find the Drifter in the Annex near Ada-1. If you didn’t maximize your potential in Season of the Forge, he’ll have a fistful of bounties you can use to accelerate your progression to 640 Power. These bounties will send you many destinations to experience action in everything from Public Events to the Crucible. We think it will take you a few hours to get caught up to the rest of the community. 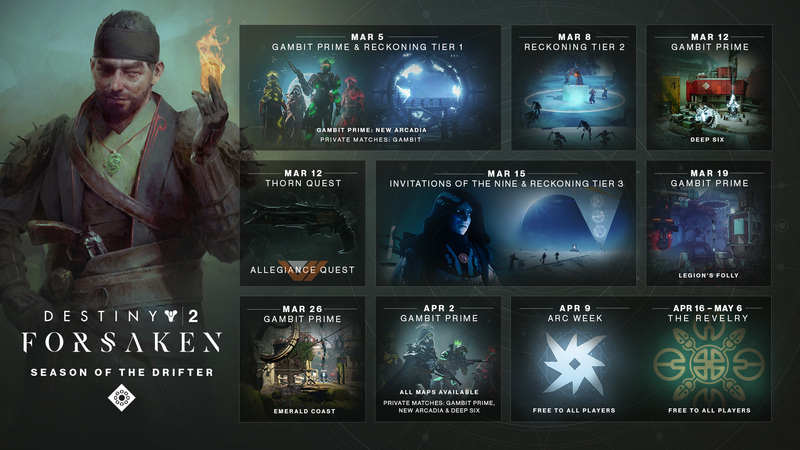 There are four new combat roles for you to discover in Gambit Prime, and each of them has a specific armor set with perks that will equip you for each. As you earn these armor pieces, you can become the master of a specific role or mix and match them to invent a whole new combinations of strengths. The Guardian you bring on the field in Gambit Prime can be as unique as you are! There is a whole calendar of events and activities that we’re looking forward to releasing. The Reckoning is our first PVE activity that will bring four players together through matchmaking. You’ll see our first ever spring event in Destiny, returning you to a familiar forest in bloom with new rewards. There are even secrets that you won’t find on our gameplay calendar. Destiny will continue to be a game that surprises you and challenges you in new and exciting ways. We hope to you see out there in the wild. Thanks for playing. We look forward to the community chatter about the new content. The Drifter will see you now!